Last week's Holocaust Memorial Day, part of that dubious practice in which we assign one day to important events and people, Mothers, Grandmothers, Presidents, Veterans, WW2 and forget them the rest of the time, has come and gone. But the Holocaust itself was long ago co-opted to promote a humanist philosophy of universal tolerance, and in doing so it was universalized and turned into nothing more than another reason we all need to learn to get along. Some have expressed wonderment that European countries and cities where Muslim persecution and violence is intimidating and driving out Jews at a rate unseen since the 1930's are still going through the farce of holding official ceremonies, nodding at how awful the whole thing was and beaming confidently that it can never happen again. But the humanist hijacking of the Holocaust is only another of the weapons used to promote tolerance toward Muslims, and intolerance toward Jews. The universalization of the Holocaust was also the dejudaization of the Holocaust, turning the dwindling number of survivors into props in the great international classroom of tolerance, even as rocks are being thrown at their heads by the Muslim beneficiaries of that school of tolerance. All the while the humanist hijackers of the Holocaust who vociferously insist on using the murder of six million Jews as an illustration in their multicultural curriculum, angrily denounce any Jews who actually try to connect the hate toward Jews then and the hate toward Jews now. The same humanists who cynically exploit the Holocaust in their distorted version of history can always be counted on to jump up and denounce Jews for... exploiting the Holocaust. But the Holocaust does indeed have a very important lesson to teach both Jews and non-Jews. Not the lesson of universal tolerance, but the lesson of the need for individuals and communities to be able to defend themselves. There are essentially two responses to the Holocaust. The first is the humanist one, which treated the murder of six million as a "teachable moment" in which the world could be led to a great moral awakening that would insure that nothing like it could ever happen again. Ridiculous amounts of Jews and non-Jews in the West accepted it as a given, just as they had accepted it as a given in the 1930's that no such event could ever take place in a civilized country. That faith in human moral evolution was a product of the Enlightenment and for all its pretenses at a higher morality, was based on the arrogant notion that people were becoming progressively more moral, as they became more educated. That correlation was the product of a misplaced faith in culture as morality. The Nazis conclusively demonstrated that technological and cultural sophistication is not indivisible from morality, that one can be a cultured monster after all. There has been no great moral awakening since 1948. Anti-semitism became slightly less fashionable for a while, but is making a strong comeback. The world has seen genocides happen and done nothing while they happened. The vast array of humanitarian organizations created after WW2 have on the balance done as much harm as good. The UN has shown that not only is it as useless as the League of Nations in serving as either a means of active intervention, or even as a voice of conscience, but that it can actually be turned into a puppet of the killers themselves with very little effort. The multicultural societies of the West have not stopped bigotry, in many cases they have actually fostered it. The great humanist experiment is dead, though its stench is impossible to escape. Nevertheless Jews in the West have become painfully invested in the humanist answer, because it is so optimistic about human nature and so very comforting. To believe that people coming together will end all evil in a flash of universal understanding is the pseudo-religious impulse inherent in so many political movements. The idea that the Holocaust was a mistake that the world overlooked, but that can be transformed into a positive impulse with enough readings of the Diary of Anne Frank is childishly naive and yet painfully human. But more is asked of adults when confronting human evil, than of 13 year old girls. Because Anne Frank was not murdered by people who killed because they had not read Anne Frank's diary as children. She was killed by people, who in many cases would have been entirely capable of reading her diary, empathizing with it and yet killing her anyway. The inability to understand this is why so many Jews continue to cling to the humanistic promise of a better world, little realizing that the world is simply the environment in which human nature expresses itself. That the environment can be improved, but human nature will remain the same. And so we come to the second response to the Holocaust, the practical one. This response does not concern itself with all the asinine humanist philosophizing. Instead it strips down the Holocaust to the bare bones as an event in which large numbers of Jews were killed by or for the most part with the cooperation of the authorities, and its solution is to remove the Jews from the jurisdiction of those authorities... and into their own national jurisdiction. To the humanists, the reason for the Holocaust was intolerance. To the practical minded, the reason for the Holocaust was that Jews were vulnerable and therefore targets. Both were talking about the same thing, but their emphasis was very different. The humanists' prescription for Jews smacked of Stockholm Syndrome, the practical position on the other hand was a matter of simple self-defense. The State of Israel was not born out of the Holocaust, but out of a national longing for the land that was 2000 years old. But the Holocaust helped define the need for that land, even to those who could not feel that longing. It provided a practical answer to the practical problem of Jewish survival, and that was something the humanists could never forgive it for. The conflict between the humanist and the practical solution to the Holocaust underlies much of the distaste and even outright hatred of the left for Israel. Because the creation of the State of Israel in the aftermath of the Holocaust has always seemed to the Humanists like a deliberate rejection of their philosophy, a retreat into nationalism, which to them was the very cause of the Holocaust. While it was the USSR that innovated the meme that the Jews were the new Nazis, their lefty fellow travelers quickly picked up the idea because it was a logical outgrowth of their philosophy that you were either part of the collective solidarity of mankind or one of the killers. Part of the solution or part of the problem. In their minds the creation of Israel was millions of Jews opting out of being the solution and becoming the problem instead. And now for the left, Israel is the great problem of the world. Because it demonstrated a lack of confidence in the humanist solution of teaching universal tolerance and fostering a great moral awakening in mankind. As Einstein breezily told the commission, Israel was unnecessary because something like the Holocaust could never happen again. And that particular brand of humanist arrogance can only deal with the rising hatred toward Jews by insisting that their multicultural project is working perfectly... but it is the Jews themselves who are at fault. Yet today critics point out that Jews are endangered in Israel, which they argue proves that the practical solution is no solution as well. And that's true. But it ignores the actual practical solution, which is not to merely build a country, but to build an independent country. And while Israel was relatively independent for the first few decades, it has become steadily more dependent; politically, economically, psychologically and culturally dependent. And that dependence is what is now crushing the life out of the nation. The Jews of Europe in the 1930's depended on the authorities to protect them. That made them dependent. Being dependent only made them more vulnerable. This fed the same vicious cycle that had destroyed Jewish community after community in Europe. Because the Jews could only be safe by depending on written or oral promises from the ruler that their rights would be respected if they settled in City X or Town Y. And then where there was a budget squeeze, taxes and fines would be targeted at them, and eventually riots and property seizures. The survivors would try to hang on or flee, and either way the cycle would begin again. The Jewish communities were dependent on the rulers, and that in turn made them targets, which only made them more dependent on the goodwill of the rulers. The extent to which you depend on the protection of the authorities limits your ability to dictate the terms of that protection. In the contemporary American example, you can have smaller government and armed town watches... or a ban on guns and a cop on every block with the right to enter your home if he pleases. The more you depend on the authorities for protection, the less say you have in how you get protected, and the more those who protect you, rule over you. Israel started out controlling its own security, but through its growing alliance with the United States, has increasingly lost control of its own security. In 1981 Saddam Hussein began developing nuclear technology, Israel did not ask the United States for permission before launching a covert mission to bomb his Osirak reactor. In 1992, Israel was not even allowed to bomb the Scud missile sites pounding its cities. Instead the country was forced to rely on imported US troops with Patriot missiles to provide its security for it. Today less than 30 years later it is assumed that Israel needs American permission before launching an attack on Iran's reactors. In the 1950's, Israel responded to terrorist attacks from Gaza by covertly sending troops across the border into Egypt and wiping out the villages that were the source of the attacks. Today when Israel shoots a single terrorist, US and European governments immediately summon the Israeli ambassador to demand an explanation and issue official statements condemning the killing. In 1967, facing an Egyptian invasion-- Israel took the element of surprise and struck first. In six days, the forces of Egypt and Jordan were routed, Jerusalem, Gaza, Judea, Sinai and the Shomron were liberated. In 1973, facing another invasion, the Israeli government bowed to pressure from Kissinger and waited for the attack to come. The resulting war nearly destroyed Israel. Israel has become dependent. The alliance with the US, one that was logical and mutually useful, when the US needed to move into the Middle East to counterbalance Soviet influence, has turned dysfunctional as its leaders have begun to act like proconsuls, demanding an endless feast of concessions from Israel to appease Islamic terrorists. Meanwhile Israeli governments have come to accept an inferior role, while taking at face value the promises that the US will guarantee its security. In the 1930's, the Czechs believed that the Western powers would guarantee their security. So did the Poles. Both nations spent over 50 years as conquered nations and protectorates of other powers. The Jews of Europe expected that the authorities would protect their rights, even in the event of an invasion. What followed was the Holocaust. The only meaningful lesson of the Holocaust is that if you expect others to protect your life or your rights, you are giving them the power to take away your rights or your life, when and as they please. Israel has foolishly put itself into the familiar position of the Jews of Europe, looking to the authorities for protection and trying to win their favor, complaining about the abuse, but only sliding further into dependency. If Israel does not break that cycle, it will be destroyed. The only way it can survive, if it realizes that its people and its soldiers are the only human beings who can protect, and that only those who dictate the terms of their own protection are truly free. Netanyahu is quite a disappointment in this regard. And, if he doesn't take military action against Iran despite American objections, our survival is doubtful. Monty gave the Jews 3 weeks before they would be wiped out in 1948, and HMG knew this. But they still disarmed the Jewish resistance and did everything they could to make Arab victory a certainty, knowing all the while that the Iwajuki irregulars would take no prisoners. The Left has also betrayed Jews time and time again. and it now appears to be leftist America's turn to actively encourage yet another final solution to the Jewish problem. My second son is in the IDF, and it is in Yehovah and the IDF we must trust. Anonymous ... you said, "our survival is doubtful." Maybe I don't have a right to say anything about Israel, (I'm not Jewish) but I know who created the nation of Israel ... not man. It was by the hand of God. Until He is done with her, Israel will still be around doing fine. I don't know about what you read, but my Bible says God is still in control yet today. If He's not, when did He lose control. Knish If you haven't seen these clips yet I think you will find them of use. I recommend every reader of this blog to view them. Some say a picture is worth a thousand words. These clips exceed that limit exponentially. Knish explains the current post modern expression of Jew hatred quite well and I could not find any point of disagreement in his excellently crafted essay. Knish gives an explanation for some of the reasons but omits the deep historical and Biblical underpinnings of Hatred towards Jews throughout the last two millennium reason. To understand why the Jews, why the almost universal hatred of the Jews, I think their must be a wider and in-depth historical and religious context. Hitler understood and stated it out-loud. He just put into words what most Europeans already had internalized and made into popular dogma. Hitler understood and his ideas re; the Jews reflected all of Europe views. That’s why had so much help and cooperation from the indigenous peoples in every country in Europe. While most countries hated the Germans and the Nazis, they all hated the Jews even more and all lent Hitler a hand in the murder of Jews. This response is for Mr. FOLLOW HIM. I presume you are a Christian by suggesting that Israel was a creation of God'will because your bible (King James version I presume) tells you so. 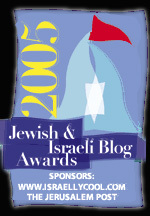 Please keep your ideas to yourself and do not give us the insideous bla bla you care about the Jewish people. There is no point in going to history and proving the Church and Christianity's role for Anti-Jewish hatred. But as of now, if you care about the Jews just because you would like to see your second coming of Christ and that I should "FOLLOW HIM" ,then I say "thanks, why dont you wait for him in Missouri, instead of Jerusalem". That's my honest opinion, I am not sure other jews would agree with me. First, wonderful analysis, you hit the nail on the head. Second I'm sorry to see that Fabian didn't understand the meaning of this article and what was its purpose. Probably there are so few truth outside, in schools, media, books, everywhere that some of the young generation can't comprehend that this was not about being nice to each other! For Fabian, English may be a second language. Which might have made it harder for him to get the point. Or this may be a spam comment promoting the Samson blinded sites. I've given it the benefit of the doubt by leaving it up. "Because Anne Frank was not murdered by people who killed because they had not read Anne Frank's diary as children. She was killed by people, who in many cases would have been entirely capable of reading her diary, empathizing with it and yet killing her anyway." A very sad truth. When I read that I remembered how Obama and many many US politicians visit Sderot and other southern Israeli cities supposedly to express compassion and solidarity with them yet endorse policies that will ultimately kill them via suicide bombers and kassams. It's too the point where I think Israel's only hope for survival is to stand alone--with Hashem of course--and do away with a secular government entirely and be ruled by religious Jews. Secular government just doesn't seem to be doing it for Israel at all. Finally, while I cannot ever forget the number of Jews murdered in the Shoah I cannot think of its victims as numbers as the Nazis tried to do. And so, let me say I am so sorry about your family. I see nothing wrong with Followings encouragement. I also wanted to mention how inspiring that last picture is, as well as the one above it. Hopefully it will kindle a fighting spirit in those who view it and read this. "Three artists from Gush Katif open exhibit as official Knesset remembrance day for the lost communities nears." Lost communities and remembrance day sounds very permanent; the beginning of an exile. They, the former residents and gov't should be fighting to get it back. Wasn't it the members of the Knesset that took their land away? Lost...what a powerful word in this context. Abandoned. Alone. Bereaved. Crazy ascribing human emotion to the land but...that's what comes to mind. And I am listening to Aaron Copeland's The Tender Land right now as I have been for a few days. I hope and pray they haven't given up hope of getting the land back. Israel does indeed need economic independence first. Regarding the Kohanim. They never ruled, except briefly during the portion of the Maccabee dynasty in the second temple era. My own view is that Israel needs minimal government, mainly for the purpose of national defense and some infrastructure projects. Beyond that there can be multiple affiliations, and a fig and vine society, where people benefit from their own labor and use portions of that labor to donate to groups and projects they support, as was the role of maaser. That means dismantling 90 percent of the bureaucracy, and most of the current system, freeing up the people to be truly productive. Yes it was indeed Knesset members. Who of course are just as hypocritical as any group of politicians. I think we have pretty much reached that point of economic independence already. We can live without America and who else extends us aid? If we had a Political leader witha vertebrae we could tell America, thanks for the MEMORIES and sell the Chinese everything they want and need. We can help them close the technology gap in order to catch up with America years ahead of schedule. All the while enriching our small country for the betterment of all of our citizenry. It isn't the Chinese pushing Israel into the Auschwitz borders of 1947? Supplying every existential enemy of Israel with the most advanced weapons? It isn't China who are trying to force upon the Jews the next holocaust? America is!!! The list of Americas perfidy against the Jews is long. America will accept assimilated ex Jews but not those of us with guns who know how to use them and are willing to do so. America like Europe loves those Jews who went meekly to their own deaths. Jews with guns scares the crap out of them. 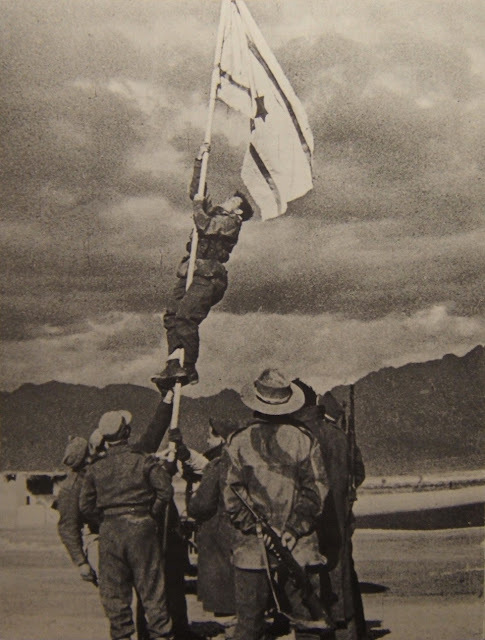 Keli, the flag in the picture was after Israel captured Eilat. They had no flag and hand painter a sheet. The Palmach commander who lead this force was one Nachum Sarig from Beit Hashita. I lived there for a number of years and he was my neighbor. His wife was the daughter of Rav Weisfish from the Nutrei Karta in Jerusalem. She taught Tanach with love and much insight to Kibbutz students young and old. They lost a son (Yossi) on the Golan in the first hours of the 73 war. The Jewish people is a National-Religious people whose fulfillment of purpose rests in the reclamation of Eretz Yisrael and in the Jewish institutions that govern it. There can be no other reasons for the establishment of a Jewish State other than for it to represent the totality of Torah thought and observance. Put more succinctly, the only viable Jewish state is a state in which Jews behave as Jews: that the law of the land is the Law of the Jews. There is no other way for one to justify the need for an independent Jewish polity. Mishne Torah, Sefer Shoftim, The Laws of Kings and Their Wars, Chapter 5, Halakha 12. At all times, a person should dwell in Eretz Yisrael, even in a city whose population is primarily of worshippers of idols, rather than dwell in the Diaspora in a city whose population is primarily Jewish. In that all who leave [the land] for the Diaspora is as though he worships idols, as it is says: They have driven me out today from dwelling in the heritage of G-d, saying, ‘Go serve other gods.’ [Shmuel I 26:19] Similarly, [Ezekiel's (13:9) prophecies of] retribution state: They shall not come to the Land of Israel. thank you for sharing the story about the commander. More of those stories need to be written today, as they used to be, at least in english, for without that, facts and arguments grow dry. Regarding China, anything we sell to them, we also sell to our enemies. Furthermore the Chinese are great at manufacturing and reverse engineering just about anything. So we can sell them the prototype, the rest they'll make themselves. China is not a solution to say the least, but it can be part of a solution in expanding new markets. Mr. Greenfield, I have read your articles on occasion, and have invariably been impressed by your intelligence, insights, and writing ability. This essay on the Holocaust is superb, and rest assured I will be a regular reader from now on. That being said, unlike several readers who have already commented above, I do not approve of Israel's selection of China as a trade partner. China is no friend of Israel, as it, along with Russia, has persistenly blocked the implementation of sanctions against Iran to deter its development of nuclear weapons. thank you, and as you can see I said above, China is no solution, and no friend of Israel. Though some are pushing just that. I do not approve of Israel's selection of China as a trade partner. China is no friend of Israel, as it, along with Russia, has persistenly blocked the implementation of sanctions against Iran to deter its development of nuclear weapons. Do you then approve of America as a trading partner with China? Re: sanctions, Even if everybody got on board, by the time such sanctions could be organized, implemented and really felt by Iran they would have already produced their few nukes and weaponized them. Sanctions then would be dropped and all would need to accommodate Iran as a world power and reliquish a lot of ME to their sphere of influence. It is only America, Bush and now O that will allow a nuclear Iran . It is only America, not Russia or China that is preventing so far Israel from attacking Iran till now. One can make a strong case that America has resigned itself to Iran becoming a nuclear regional power. If Israel does attack there is no doubt in my mind that we will need to use some tactical nuclear devices. When that happens we can only speculate what will happen in any of a myriad of possible scenarios. We can also lay any blame squarely on Bush and O, or America. Not China and Russia. China and Russia are not our friends but I suggest neither is America. I am relatively ignorant (meaning uninformed) on Israeli politics and epspecially history so please take my comments with that in mind:) Take it with a grain of salt. That in mind I agree with Sultan's response about Israel needing less gov't. Yammit: Thank you for explaining about the flag and the commander. I would love to learn more about him. To all above, which country today is Israel's friend in a trading situation??? Micronesia? We are advancing towards a complete boycott by the world who is seeking to destroy us, destroy a country, bring us to our knees (we are already crouching) and we fight between us? To Sammish, a Jewish Torah Israel does not need the secular system of today's government, it's obsolite. something important has just occured to me. Those who interpret Holocaust as a lesson of universal tolerance, self-identify with the Nazis. They say to themselves, "we should have not been so intolerant of the Jews". The correct lesson of course should be to recognize the Evil and to oppose it as soon as possible. It is exactly the opposite of universal tolerance - it is the lesson of complete intolerance to Evil. The lesson apparently not learnt by the West. We should be prepared to recognize evil and confront it early on. To recognize Evil we can be armed with the tools of Universal Human Rights - exactly in denying those rights to others is where Evil exposes itself. NO TOLERANCE FOR THE INTOLERANT! These values I think should be chosen as CORE VALUES of the Free World's value system, its ethical axioms. A monument in remembrance of the event was erected in 1996 and a photo of the monument side by side with a photo of the hoisting of the ink flag can be seen at the bottom of . Yossi Sarig the middle son of Nahum was a tank commander on the Golan and was killed on the first day of the war in 73, He was a prolific song writer and this song has become a classic. If I can find the musical rendition I will post you a link. Yossi played trumpet and piano. Well taken with salt, and I intended earlier too. No harm. 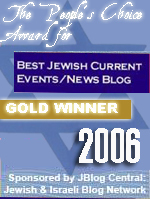 I only meant prudence of wish in the idea that Israel should be ruled by religious Jews. I took it semantically. What is a rule by the religious? A theocracy of sort. Well I know that a true Jewish theocracy is not and cannot be the usual theocracy we associated with the term when we look at all the theocracies in place. At the heart of it all, is not so much whether a Jewish theocracy is impossible in a modern world. It is whether it can survive the destructive nature of secular (self-destructive), and totalitarian theocracies already present (Iran, Saudi Arabia, Hamas etc…..). Yammit! THANK YOU! What a remarkable story of Israel's history. Democracy is a comfortable order for established societies, but in times of crises, the Romans appointed dictators. Small groups are still reasoning entities, but reason disappears from large populations. The major reason for that is the tendency of a mob to sink to the lowest common denominator: People shrink from offending others, realizing subconsciously that that may be dangerous, and seek common ground with them. The common point is the lowest common denominator, and for a large country this denominator is really low. Small groups are still reasoning entities, but reason disappears from large populations. The major reason for that is the tendency of a mob to sink to the lowest common denominator: people shrink from offending others, realizing subconsciously that that may be dangerous, and seek common ground with them. The common point is the lowest common denominator, and for a large country this denominator is really low. Democracy was never practiced on a large scale in antiquity, but only in small cities where participatory democracy remains viable. In all cases, democracy quickly eroded into demagoguery, tyranny, and then monarchy. There are three viable alternatives to democracy. Two of them are biblically sanctioned: anarchy and monarchy, while the third was employed by Jews throughout most of our history—theocracy. Anarchy operates as a network of townships bonded together by mutual defense agreements, common and criminal law. The legal system is kept to a minimum, and people are free to a great extent. Theocracy served the Jews well for nineteen centuries. It wasn’t perfect, but it was workable. No realistically electable politician in Israel is better than BB. But there are viable forms of Jewish government better than democracy, in which the likes of BB, olmert etc would never succeed to leadership positions. Sultan: To reduce beauracracy in Israel do you think downsizing at the local level could be a practical first step? The reason I ask is: In Buffalo/WNY there was a large push among some groups for regionalism years ago. Since then, there's been a huge backlash re regionalism with both the city and even smaller towns fighting for the rights of its citizens to downsize, starting with Common Councils/town councils. After a very contentious battle for the right to vote on downsizing the council in Buffalo a few years ago we voted to downsize it. The public hearing in council chambers before the vote was in the middle of summer and the chambers packed. The meeting lasted from 6 PM till after midnight, with citizen after citizen giving his and her opinion. The whole thing had a "Mr. Smith Goes to Washington" feel about it. Passionate arguments to the point of exhaustion. Exhausting but quite energizing--and the council was downsized, from 13 seats to 9. Recently the town of Batavia, NY (or one of the other small towns) fought for the right to downsize its council. They won the right and voted to downsize it. And as in Buffalo, a tremendous sense of victory. Could these types of political battles and victories at the local level help to energize Israelis, too? After local downsizing they could move to more regional downsizing. Just some thoughts, I have no clue about Israeli gov't especially at the local levels. I would certainly question the idea that the Jews were ruled by a theocracy for nineteen centuries. They weren't even ruled by one in Israel. Jewish communities sometimes had rabbinical leadership, but in practical lay leaders were and are more likely to call the shots. Essentially the same King and Temple split was present there as well. Regarding actual theocracy, that only works better when it's under divine guidance. Without that, it's just another system of authority, and one that's not open to checks and balances. Take a look at the Haredi world to see how well that works. Under proper Torah law, government was minimal. Even criminal law was bare bones, with a high standard of evidence required for a conviction. Regionalism would be key in Israel for democratization, but unfortunately at the local level, it mainly adds to the tiers of bureaucracy. Some local councils are better run and less bureaucratic, but they're often the exception to the rule. "Those who interpret Holocaust as a lesson of universal tolerance, self-identify with the Nazis. They say to themselves, "we should have not been so intolerant of the Jews"." The State of Israel, even with its weak government and vacillating humanistic outlook which perennially puts itself at risk - given all its faults and flashes of brilliance - it just may be that the State of Israel and the land it holds is the only thing stopping the pogroms from once again mushrooming all over Europe. I got to thinking about the converse. Those of us who identify with the Jews instead ask ourselves, "Am I willing to gamble my life and the lives of all my loved ones on the hope that I can persuade this murderous bully to be more tolerant?" I hope that is the case. I also hope that Israel doesn't wait too long to attack Iran. I hope and pray that when Jews say Never Again they realize that the rest of world really doesn't mean it when they say Never Again. Great article. You nailed it regarding the source of the "anti-zionist" hatred of leftist eurotrash "intelligentsia", mostly orphans of the Berlin Wall, still trying to fit facts to theory, even after all these years. Israel is an affront to their fantasy-world of abstract "love of humanity" (BTW, this very same concept was widespread in 19th century europe, and was a major drive of secular antisemitism: check the outstanding book "German question/ Jewish question, revolutionary antisemitism from Kant to Wagner", by Israeli historian Paul Lawrence Rose). Moreover, what also pisses those ex-cathedra moral masturbators and pseudo-intl lawers big-time is that though Israel isn´t perfect (as they maliciously demand of her as of no other country) she still is a vibrant democracy, technologically advanced, plural, lawful and managed to carry its existence-threatening wars in a quite decent way. That´s why they have to invent all kinds of contortions to find ways to indict and smear, a hard job, but a major thrill for those types. I also used to believe in what philosopher John Kekes calls "the secular faith" of the Enlightenment, i.e., that humankind is essentially good and is only corrupted by "society". Though education, socio-economic improvement, science, democracy , free inquiry are still fundamental (the positive legacy of the Enlightenment), what human history seems to teach us is that humans are neither essentially evil (as some christians claim) nor essentially good, but essential ambivalent. In particular, it follows that evil will never be completely erradicated (final solutions are also a dangerous obsession of utopians, as we know). The best we can do is trying to avoid its spread and containing its damage. To think there´s a redemption around the corner (religious or secular) is unrealistic, childish and dangerous. Well, enough ranting. Best Regards! Brilliant piece that gets right to the central issue: Jews must stop depending on others for safety. We must look to ourselves. Caroline Glick spoke at a temple in Queens this year (2011) and made that case clearly and strongly. You two are such amazing voices for Jews everywhere. If only Jews would wake up. We are such a little tribe and things do not look good for us these days. (As if they ever have.) G-d bless you, Mr. Greenfield. here we are again 2014: jews forced to register in the ukraine, days later temples bombed. it's back, & not going away anytime soon. the US is as anti semtic as it was the 1930s. i dont know what to say.